This page describes the basic steps club members need to take if they want to add things to this website themselves, or update existing content. The site has been set up in the form of a “blog”, which for our purposes really means a publishing system that you can just use without knowing any technical stuff. The blog is hosted for free at www.wordpress.com, which saves us the hassle of setting up a service provider ourselves and administering the software directly, paying for webspace, etc. This should be especially useful when handing over responsibility for looking after the site as the experts retire from the club. 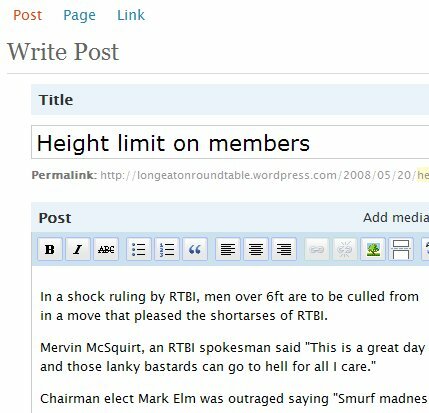 Even though it is hosted by someone else, this is largely hidden from the outside world as we still use our own URL – longeatonroundtable.org.uk – to access it. 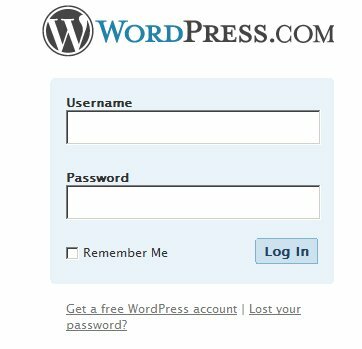 The only real effect on having it hosted by WordPress is that anyone who wants to write articles for the site must sign up for a WordPress account first. The sign up process is straightforward – you just need an email address that works. Once you get to the page “Check your Email to Complete Registration”, just do as it says. When the email arrives, click on the link within it to activate the account. You can then go back to the main page of the LERT site and press “login” again. This time enter the details you have just created. If you check the “remember me” box then you shouldn’t have to login again from the same computer. This will bring you to the front page of WordPress – the system that is hosting our website as described earlier. From here you can do all sorts of stuff, including creating your own blog website if you really want! But that’s not going to help you write stuff for the LERT site. What you need to do next is contact Greg, and let him know the email address that you used to create your account. As soon as I’ve got that I will add you as a user who can create and publish new stuff, edit it after it has been posted, and upload files (including pictures). If you need to do more than this – i.e. edit other content, be able to delete things, then ask to be an “editor” rather than an “author”. For a brief description on the different types of user, see this link. You will also notice more options on most pages. While all this may sound like a complete arse to do, it is just a one-off process. After that, you just login and write stuff. “Posts” – these are the articles that appear in the central part of the home page of the site. The system automatically displays the newset one first, with earlier posts shown further down. It also automatically organises posts into”Recent Posts”, “Archives” etc. “Pages” – These are more general articles that appear along the top tabs and in the “pages” section. Whereas posts are generally date-stamped news items, the content of posts is more factual information about the club that we want to be visible all the time. This link provides a more concise description of posts and pages. The third item is a “Link”, which provides a way of adding permanent links to the sidebar of the website. We could, for example, link to our sponsors from here, and/or provide links to member’s businesses if people like. 90% of the time I would expect people to just be writing posts. If you have ever used Word or email, then the user interface for writing stuff is obvious, and I won’t describe it here. You can upload pictures from the “Add media” button on the Post bar. When you are finished you just press the Publish button. 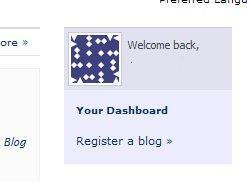 Then go to the main page (there’s a link “Visit Site” at the top to help), and you’ll see your post at the top. Don’t worry about tags, categories etc. By all means use them if you want, but as admin I can sort these out later if needed. 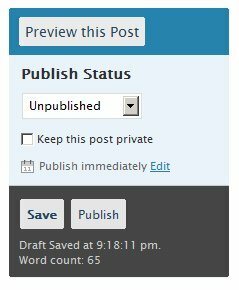 Should you need to update existing content, just browse to the page when logged in, and an “Edit” link should be there. Click this, and you are taken to the same page as you would get when writing a post. The process is the same, except “Save” will actually update your changes immediately – you don’t have to republish. 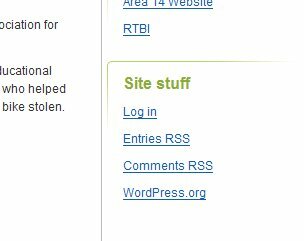 I’ve described in somewhat nauseating detail the basics of getting stuff onto the LERT site. You are now a certified blogger! Don’t be put off by the detail I’ve gone in to – it really is trivial and looks a lot harder than it really is. There is a whole load more you can do, and if you are interested then just explore and poke around the links and see what you can see. There’s not much point in me describing this in detail -if you have any questions at all then just contact Greg.